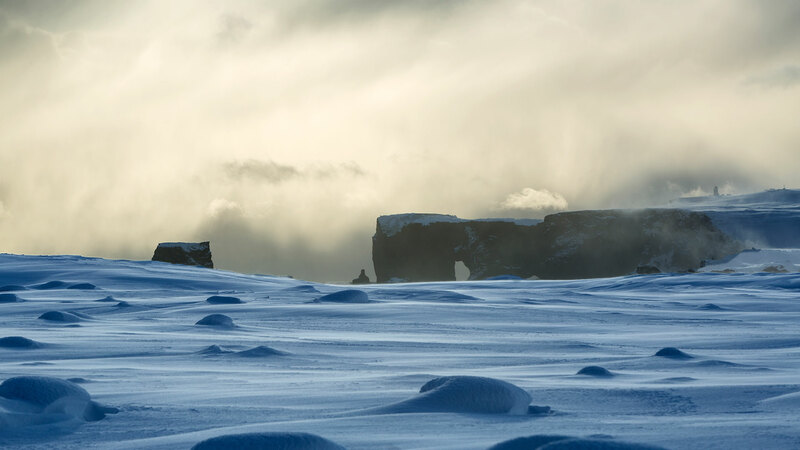 Make the most of your winter break with this guided small group tour along the scenic south coast of Iceland. Enjoy the wondrous winter scenery, majestic northern lights, idyllic ice cave, the glorious glacier lagoon and the classic Golden Circle. Enjoy the knowledge and personal interaction with a local guide while visiting renowned natural attractions, and hidden gems, in the tranquillity of the winter season. Would it suit you better to enjoy this trip as a private tour? 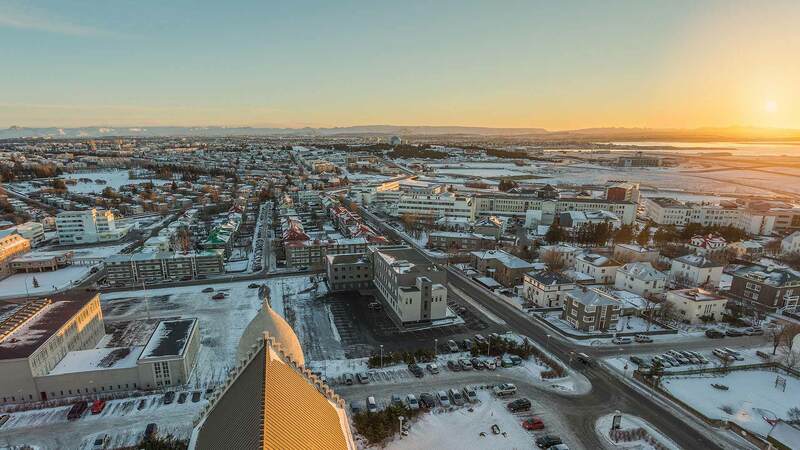 On arrival at Keflavik International Airport, you will be greeted by a driver who will transfer you to your hotel in the city centre of Reykjavík. After settling in, the rest of the day is free for you to explore the vibrant capital city with its abundance of museums, restaurants and bars to suit all tastes. If you're interested in checking out Icelandic design or experiencing the city's thriving coffee culture, head to the main street, Laugavegur, and enjoy its various shops and cosy cafes. Spend the night at the Icelandair Hotel Reykjavik Marina or similar. For those arriving early today you have the option to upgrade your journey from the airport with a visit to the Blue Lagoon geothermal spa before heading to Reykjavik. It´s the perfect way to start your Iceland adventure! Enjoy an early breakfast at the hotel before being picked up by your guide. The first leg of our journey is travelling along the south coast toward Kirkjubæjarklaustur. 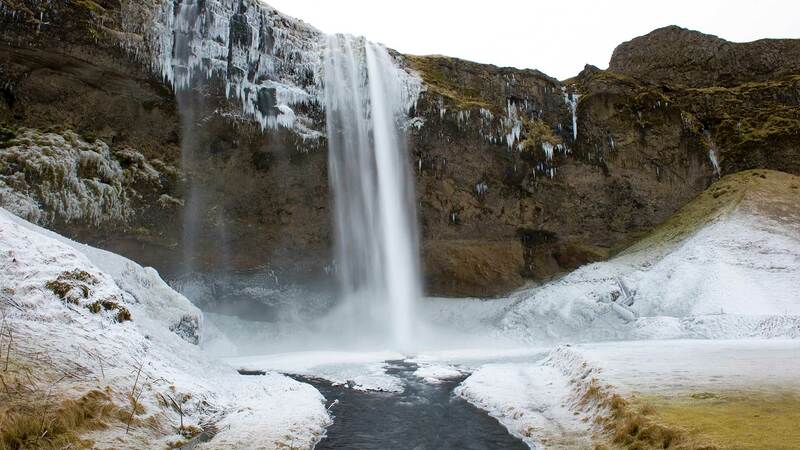 We will visit sights including the Seljalandsfoss waterfall—the only of its kind in Iceland where you can walk behind the roaring cascade on a footpath, followed by the magnificent 60-metre free-falling Skógafoss waterfall. 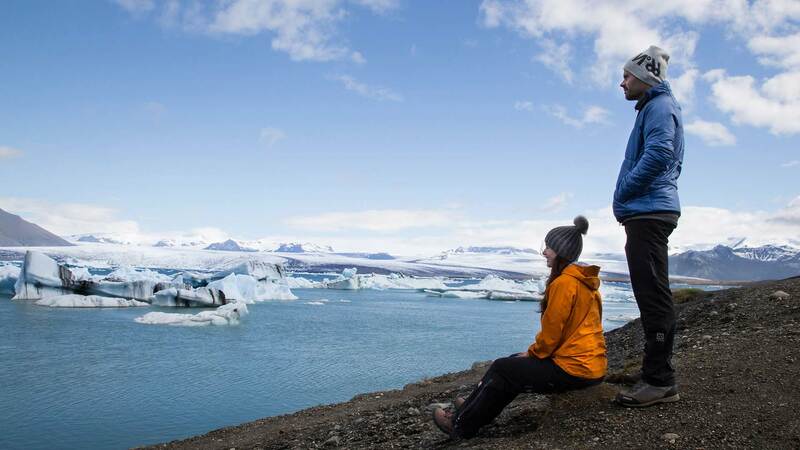 From there, the journey takes you past the beautiful Eyjafjöll mountain range, including Eyjafjallajökull, a volcano completely covered by an ice cap, towards the volcanic black sand beaches near the village of Vík í Mýrdal. One of the highlights is visiting Reynisfjara, one of the most famous beaches in Iceland. You can also get some great photos with the unique Reynisdrangar basalt columns jutting out of the ocean. Next, you will travel to your carefully selected charming boutique hotel, situated far away from the city lights to give you the best chance of seeing the northern lights. Spend the night at the Magma Hotel. Average Driving Distance: 285 km / 176 mi. *Please note that the northern lights are a natural phenomenon. If weather conditions and visability are not favourable, the guide will inform you about the matter. Start the day bright and early as you have a full day of exciting highlights ahead of you. 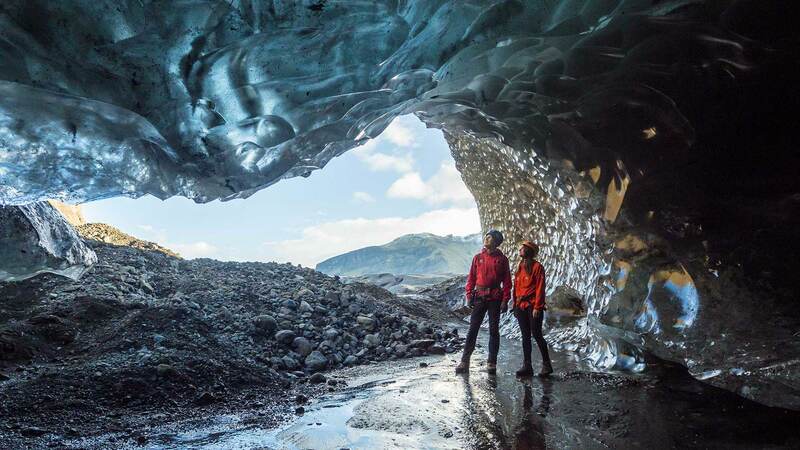 Today, you and fellow travellers will join an ice cave and glacier walking tour to Vatnajökull Glacier, the largest glacier in Europe! It´s truly a once in a lifetime experience exploring an ice cave, and it is suitable for travellers that can comfortably walk on uneven surfaces*. 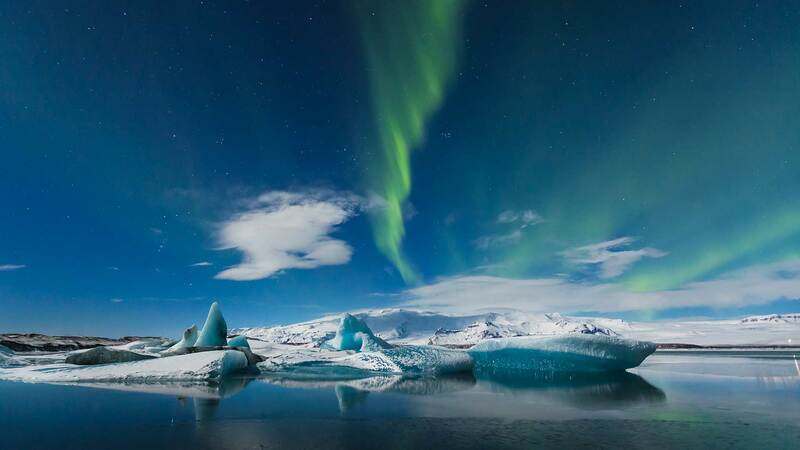 Also on the agenda, is heading to the spectacular Jökulsárlón glacier lagoon, famous for its floating icebergs in shades of milky white and bright blue. Next to the glacier lagoon we will stop at the Diamond Beach where you will see big chunks of ice that have washed up on shore after being polished in the surf of the glacier lagoon. After our exploration we will be heading back to our accommodation for the night. Local dinner will be served and afterwards you can end the evening by putting on some warm clothes for going out to gaze at the sky waiting for the northern lights to appear. Average Driving Distance: 260 km / 161 mi. Today the group will explore the world famous Golden Circle, a popular route for viewing some of the best-known natural sites in Iceland. 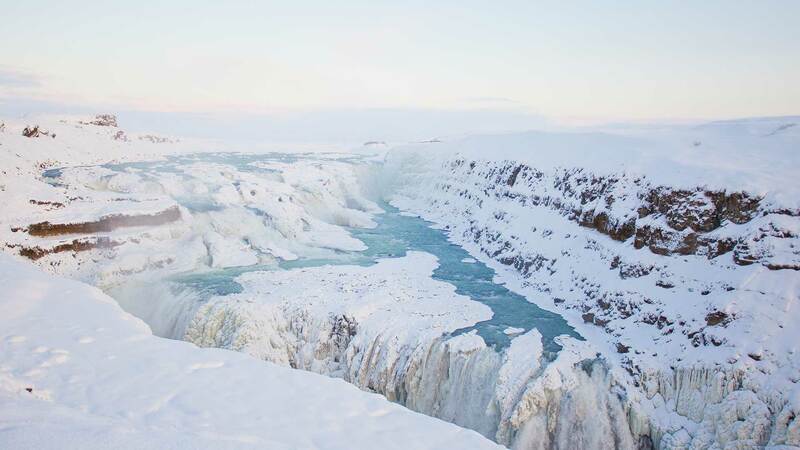 Your first stop is the picture perfect two-tiered Gullfoss waterfall, where you can see the water thrash and tumble before falling metres below. 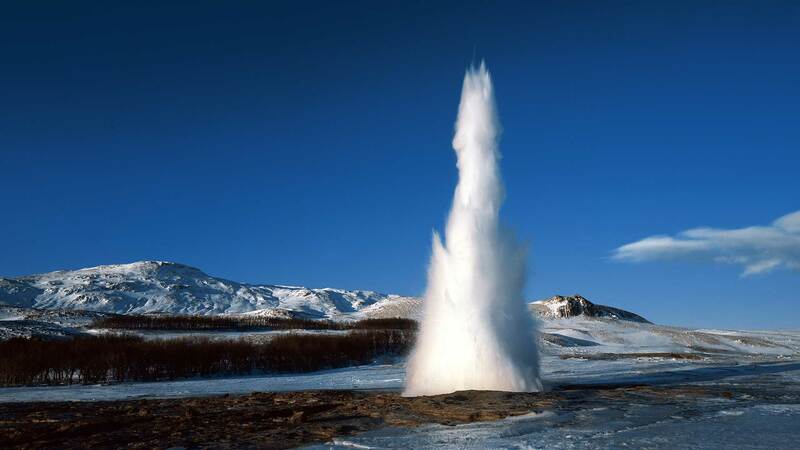 Next, you will be driven to the Geysir area and explore the bubbling mud pots and spouting Strokkur geyser, which erupts steam and boiling water metres into the air every few minutes. Our guide will be sharing stories of this beautiful sight and why it is a favourite among locals and travellers! We end the day with a visit to Þingvellir National Park before heading back to Reykjavik. 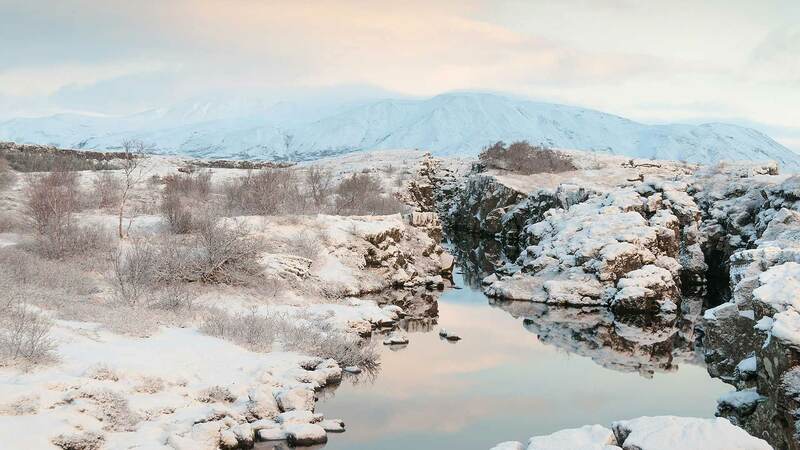 Þingvellir was named a UNESCO World Heritage Site for being historically significant to the founding of Icelandic democracy and a place of immense natural beauty. The park is also home to the north Atlantic ridge, where visitors can dive the fissure, between continental plates. Average Driving Distance: 385 km / 239 mi. When it’s time for your Iceland adventure to end, you will be picked up from the hotel for your airport transfer by a shuttle bus about three hours before your flight. If you’re flying in the afternoon, you have the option to visit the Blue Lagoon geothermal spa to relax in the warm mineral waters before continuing to the airport (optional: not included). 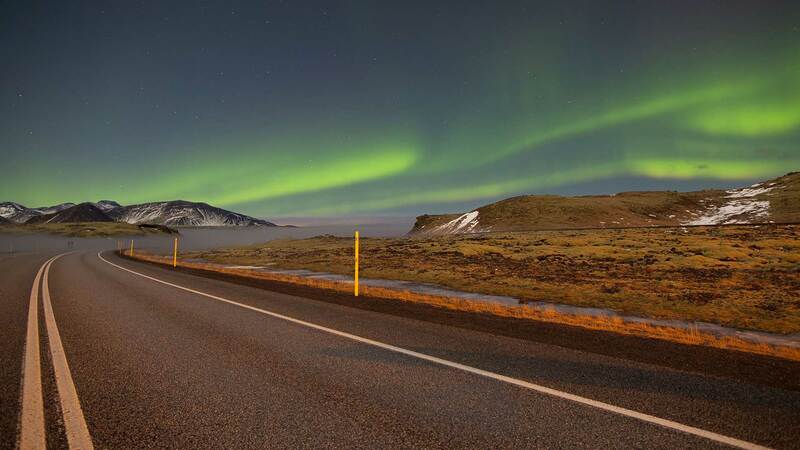 If you are interested in extending your stay, we can book extra nights and activities in the Reykjavík area or even combine this tour with a visit to one of our other Nordic destinations. Glad we found you amongst all the other tour companies we could have chosen from. Nordic Visitor made everything easy from start to finish, but better than that, the tour was stunningly beautiful and our guide took us to off-the-itinerary and off-the-beaten path waterfalls and canyons that really highlighted the beauty of Iceland and made us feel like we were getting a special, secret treat we'd never have found on our own. Our experience was well beyond our already high expectations. The coordination of the whole trip was flawless, with a friendly and reliable support from our tour agent Dagný, followed by an incredibly knowledgeable and enthusiastic guide Simone who took close care of us along our trip. And of course, a whole professional organization backing this up and making it happen. My wife and I are fairly well travelled and this is the first vacation that we have taken where absolutely every aspect exceeded our expectations. From my first contact with Anita at Nordic Visitor (via email) to arrange the trip, and because of our amazing guide Trausti - this will be a vacation that will be very, very hard to beat! We will recommend Nordic to everyone we know and will only use your company when travelling to this region next! Again, thank you all for a most memorable vacation! The tour exceeded my expectations. It was an unforgettable experience to an extraordinarily beautiful country. The tour guide was sincere, knowledgeable and kind. He being a native to Iceland made the experience even more authentic. The group size was perfect, enabling the guide to personalize the tour even more. It was good to have some personal time in Reykjavik to explore on my own. I felt it a very walkable city, and I felt completely safe exploring on my own. The locals were always friendly, and willing to help me find my way when I got a little turned around. I've wanted to visit Iceland four about 12 years, and realizing a dream through this tour was more than I could have asked for. Thank you - I'll be returning to Iceland! Our tour guide was excellent and ensured out experience was as smooth as possible. She was incredibly enthusiastic and considered the time we wanted to spend at certain locations, and stopped at additional locations that she knew we would enjoy whenever possible. The accommodations for this tour include comfortable three-star (or similar quality) hotels or well-appointed guesthouses that have been hand-picked by our local travel experts for quality and location. The rooms all have private WC and shower or bath. All provide breakfast (included in the price). The hotels mentioned are our first priority for this tour. Please note that although we have included specific accommodations in the tour, these are subject to change in rare cases. We reserve the right to substitute a named property in the same locality for one of a similar standard. We will send you the final list of hotels before you arrive for your tour. We recommend that all of our travellers read through the following information about what the tour includes, what to pack for your holiday and useful information about the activities included on the tour. Our team of local expert guides at Nordic Visitor are highly recommended by our travellers and staff with years of experience. What they offer is local knowledge, love for their country, their stories, favourite places and sites where travelers, on their own, would not hear about or visit. They always have some tricks up their sleeves and hidden gems to surprise our clients and therefore we recommend that you join our guided small group tours to get a personal experience for your Icelandic adventure. There will be one guide per tour, who will drive and lead the tour. For winter tours, our guide will provide you with blankets and crampons to borrow at any time. Please be advised that this tour is not recommended for families with young children. Our team of local travel experts at Nordic Visitor have put together a list of wonderful hotels for your stay in Iceland. The hotels that we use are based on our top favourites in Reykjavik and in the countryside, with an emphasis on quality, excellent ratings and comfort. As one of our main aims for our winter tours is to increase your chance of seeing the northern lights, we have selected a hotel located in rural areas, far from city lights. Note: Triple rooms are not available for this tour, only single and double rooms. A daily breakfast buffet is included at the hotels during your stay. You will also enjoy two included dinners at Magma Hotel. They will include either a set dinner menu or a dinner buffet with a good variety of local fresh ingredients. You can choose meat, fish or vegetarian dishes by notifying your travel consultant in advance of any dietery restrictions. Other meals are not included, but the guide will make sure to stop along the way for you to pick up snacks, drinks and lunch. Drinks are also not included during the trip. You will find a great selection of restaurants in Reykjavik during your stay for the first and last night in the city centre. The average cost of meals depend on the type of restaurant, but for lunch we’d say that the average cost is from 2500 ISK to 3500 ISK. The average cost of dinner can range from 3000 ISK up to 6500 ISK for the main entree. Three course dinners at restaurants are priced around 7000 ISK to 11000 ISK. Please be advised that the ice cave & glacier walk tour is very weather dependent. Sometimes the tour has to be cancelled with short notice due to weather conditions or other safety concerns. After periods of adverse weather, the caves can become flooded, unstable or unsafe to enter. If this happens, a full refund will be provided for the tour. Also, please keep in mind that your group might not be the only group visiting the ice cave during the tour. Please note that the northern lights are a natural phenomenon and sightings cannot be guaranteed. You will stay in a rural hotel to maximise your chances of seeing the northern lights. For more information on what to pack, please visit our Online Travel Guide. To ensure comfortable seating for everyone on our tour, we need to limit the size and amount of luggage on the van. Each guest is allowed one suitcase or large bag that can be stored in the back of the van and one smaller item (e.g., a small backpack or daypack) to keep inside the van for daily essentials like camera, wallet, medications and so forth. Unfortunately carry-on suitcases (cabin bags) are too large to store inside the van in the overhead racks. If you have any questions about luggage your Nordic Visitor travel consultant will be able to assist you. Please note that the programme is dependent upon weather and road conditions, and may be altered if conditions are not favourable. In the case of major changes to the programme, you will be notified and we will do our best to make sure that your experience will not be affected. For information on weather conditions and daylight hours we recommend visiting our extensive Online Travel Guide.